Over the course of its 150 years, the Bellamy has seen many stories: the story of its creators, two Yankee architects; the story of its builders, mostly slave laborers; and the story of the city that it is in, Wilmington. Surpassed as North Carolina’s largest city by Charlotte during the early twentieth century, Wilmington stands today as a center for cultural heritage and exploration. The Bellamy Mansion tells the story of its owners, a wealthy family with deep roots in the low country of the South, who lived and loved in the house for nearly eighty-five years, and of the innovation in its design, with domestic arrangements and technological achievements considered cutting-edge at the time. Ultimately, the most compelling story that the Bellamy tells today is one of the power of place, and the impact of preservation. When the last surviving child, Ellen Bellamy, passed away in 1946, the house was already falling into a state of disrepair. Although long-heralded as an architectural gem of the South, and unparalleled in its magnificence of scale, passers-by frequently commented on the lack of paint, and the poor state of the outbuildings. Unwilling to let the landmark go to waste, a plan was devised to preserve the house by two of the grandchildren, and they hired a caretaker in 1953. Occasionally, the remaining family members held gatherings there, and when the prominent architect Leslie N. Boney, Jr. married Lillian Bellamy, they held their wedding reception in the mansion. Wilmington, like many other places across the South, saw decay in urban areas and lost many of its historic buildings downtown. 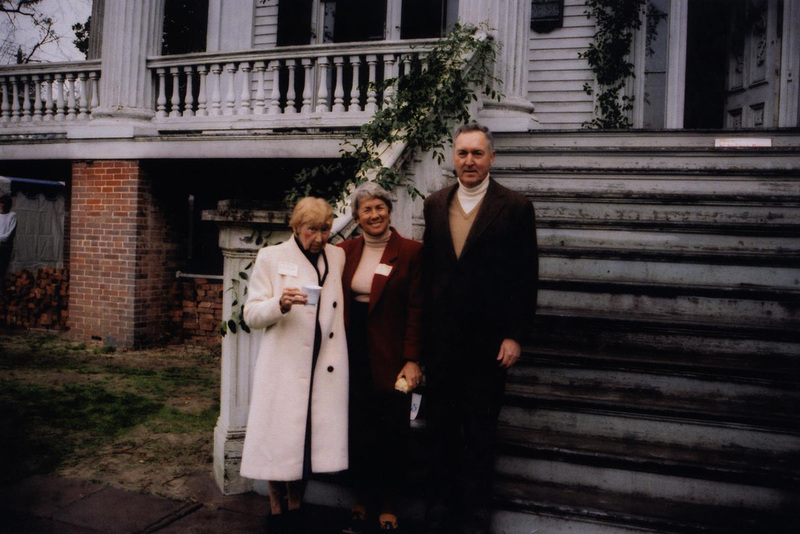 In the early 1970s, Emma and Lillian, the two owners, along with their cousin Hugh MacRae II, decided the best way to preserve the house would be to create a charitable corporate, called Bellamy Mansion, Inc. About six years after the creation of the Historic Wilmington Foundation in 1966, owners Emma and Lillian donated their interests to the organization, and it was officially incorporated by the three cousins in February of 1972. Less than a month later, the unthinkable happened. Arsonists set fire to the mansion, causing extensive damage to the interior. Luckily, the fire department arrived in time to extinguish the blaze and save much of the exterior. But fire, smoke, and water damaged much of the home's interior. Leslie and Lillian Boney at their wedding reception. The interior of the mansion after the fire. Bellamy Mansion, Inc., after being in existence for less than a month, would now have to drastically rethink its plan. Once only prepared to make ordinary repairs, the foundation would now have to take on a major restoration effort of the mansion. With extensive and creative fundraising efforts that included additional family and community members, the corporation spent the next twenty years working tirelessly to stabilize and secure the house. Restoration efforts included exterior paint, stabilization of the slave quarters, and near completion of the exterior restoration. Another great-grandchild of John D. and Eliza Bellamy, Robert R. Bellamy II, donated money to purchase the adjoining lot (the site of a house that burned down in 1980) to create parking for the mansion. All the while, fundraising efforts continued for the interior restoration. In 1989-90, the foundation made the decision to share the mansion with the public, and donated the property to Preservation North Carolina. With the transfer complete in 1993, the Bellamy Mansion became a stewardship property of PNC. By donating the property, they expanded the impact that the property would have, and significantly increased the audience that would be able to enjoy the mansion. While Miss Ellen frequently allowed visitors into her home, the vast majority of the mansion had been closed to the public for close to forty-five years. PNC began the extensive interior restoration in the early 1990s, utilizing the skills of the most talented craftsmen. The extensive smoke, water and fire damage had caused plaster to fall and break in many rooms of the house, and wood, fixtures and mirrors throughout the house were also damaged. Missing parts of the plaster were recreated by hand, as was glasswork throughout the house. The mansion was restored to its antebellum splendor of the mid-nineteenth century. In 1994, the house was opened as the Bellamy Mansion Museum of History and Design Arts, and today its story continues to unfold. The carriage house has been reconstructed and functions as a visitor center. Lectures and workshops are held throughout the year, and changing exhibits, along with the daily interpretation of the house tell the stories that make this special place unique.